Dowlais employees wearing the uniforms of the Twelfth Glamorganshire Volunteer Rifle Corps. Dowlais House, 1870. Showing front row: Dr. Burns; William Jenkins [seated]; George T Clark, trustee seated]; Dr. Pearson Cresswell [seated]. Back row: M.C. Harrison; Matthew Hirst; Edward Williams; Matthew Truran; William Menelaus, general manager; George Martin; David James. Photograph courtesy of Glamorgan Archives, Wales. 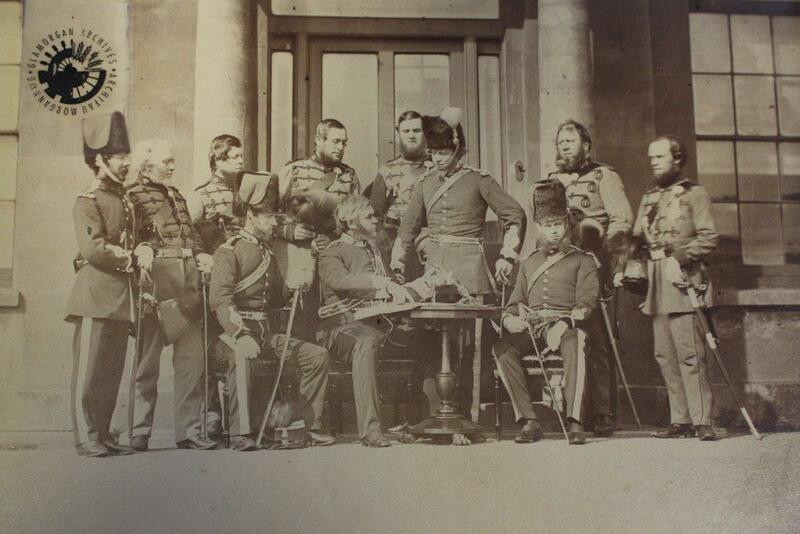 An important part of our project is attempting to chart the interconnected nature of professional men and their families in the nineteenth century, and the photograph above is a wonderful representation of this. William Jenkins (seated left on the front row) is one of the project’s cohort members, and the subject of another blog entry. He was connected to Edward Williams (standing third from left behind William) through the marriage of his daughter, Alexandra Octavia, to Edward’s son Penry. William and Edward were both members of the South Wales Institute of Engineers and the North of England Mining and Mechanical Engineers alongside Matthew Truran (stood to Edward’s left) and Matthew’s father Samuel (who sadly died in 1860 when a faulty pipe leaked poisonous gas into his office). However their connection ran even deeper, with newspaper reports of Matthew’s funeral revealing that Edward’s son Penry and his brother Aneurin (M.P for Middlesbrough) were Matthew’s nephews, thus making Edward and Matthew brothers-in-law, as well as colleagues. Alongside volunteering together in the Twelfth Glamorganshire Volunteer Rifle Corps, and working together in the Dowlais Works, many of these men and their families also held important positions in the local community. David James (standing, far right) was the cousin of cohort members Frank James, who served for many years as Registrar to Merthyr Tydfil, and on the committees of the Merthyr Board of Guardians and School Board, and Charles Herbert James who served as M.P. for Merthyr Tydfil and was chairman of the Merthyr Newspaper Company. It seems that the relationships and connections between the men who posed in their smart uniforms in front of Dowlais House in 1870 are almost too numerous to count. Yet the scope of the Professions project allows us to examine the professional and personal interactions of these men on a scale that has not previously been attempted. This analysis is slowly revealing an incredibly complex and intricate network of social capital, a concept that was central to defining and enforcing the boundaries of the professional classes.